When I make a garment, I don’t always think about how I will be wearing it. Sometimes I have these orphan garments that I know I will never get to wear unless I make a bunch of other garments to go with it. I think it’s a natural tendency for people who are detail-oriented. We look at the beauty of individual flowers, but not necessarily how they work with the entire plant and other trees to create an impressive forest. I don’t think it’s a problem to admire details. I love intricate pleats, flawlessly executed invisible zipper and pretty colors in a fabric as much as the next sewist. I don’t have any statistics, but my guess is that many sewists are detail-oriented people. You almost have to be when you are sewing one seam at the time to create a garment. But having the perspective of the big picture is only going to do us good. After all, we can agree that most of us can’t pull off wearing floral top with floral pants in a different color palette. Individually attractive garments don’t always go together. The Make It Wear It! blog series is my attempt to be mindful of how to make our custom-made garments more wearable. I want to give you (and me) some inspiration on how to wear the clothes that we already made, as well as giving ideas on planning our wardrobe in the future. I’ve invited quite a few bloggers to share their garments and how they are styling these garments. 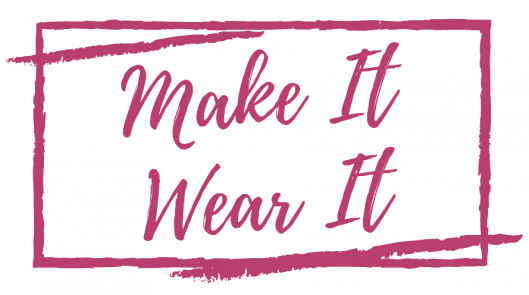 The Make It Wear It! blog series will be spread out and will run until the end of the year. 3 Ways to Wear it—Make one garment from an Itch to Stitch pattern and style it 3 different ways. RTW Inspiration—Create a garment or outfit using Itch to Stitch patterns to imitate a ready-to-wear (RTW) garment/outfit. Dressed by ITS—Make one or more garments from Itch to Stitch pattern(s) to wear with your existing Itch to Stitch garments. Unsurprisingly, the blog series will focus on Itch to Stitch patterns. But I did ask the blogger to wear their ready-to-wear clothing and accessories to complete an outfit. I know that many sewists’ aspiration is to wear only self-made clothing. But those of us who are not quite there yet don’t need to despair. It’s completely OK to style your self-made garments with clothes you bought. It doesn’t have to all or nothing; we are at our own pace in our journey toward our goal. In a few days, I will get to share with you the first blogger, Angelica Pohle! You can follow my blog on Bloglovin’ or you can also sign up below to get the Itch to Stitch newsletter. Either way, you’ll be notified when the first issue of Make It Wear It! is up.